This article is about Big Battlefield in Super Smash Bros. Ultimate. For similar stages, see Battlefield (disambiguation). 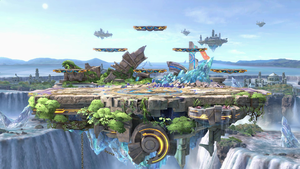 Big Battlefield (大戦場, Large Battlefield) is a stage in Super Smash Bros. Ultimate. It was revealed for Ultimate during the Nintendo Direct of E3 2018. Big Battlefield is a bigger version of Battlefield, originally designed for 8-Player Smash. With respect to the original Battlefield, the main platform of Big Battlefield is wider and there are six floating platforms instead of three, arranged in a pyramid formation. Visually, Big Battlefield still takes place in a futuristic ruins setting, with crumbled buildings on floating islands in the background. However, it now floats above a large waterfall, and large chunks of ice or crystal are present both below and on the right side of the stage. Big Battlefield's Ω form is exactly identical to Battlefield's. Its Battlefield form is also exactly identical to Battlefield. Big Battlefield is not used for any character's Classic Mode route in any form. Big Battlefield is also the only stage not used for any Spirit battles in any form. This page was last edited on April 17, 2019, at 02:45.